If you’re preparing for a move and have a surplus of unused or unwanted items, organizing a garage sale may be your solution. Here are some tips provided by UF Mover Guys — the moving company Gainesville, FL, residents trust. 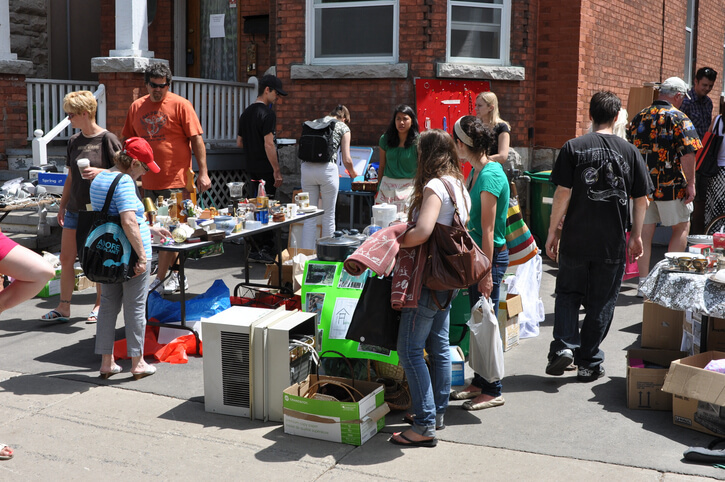 Choosing a date is one of the first steps to pulling off a successful garage sale. Planning the sale a few weeks in advance gives you plenty of time to identify unwanted items, price the items appropriately and advertise the sale. The majority of garage sales occur on both Saturday and Sunday. Gainesville movers suggest scheduling a weekend sale to increase the chances of more business — which will ideally generate more success. Another detail to determine is how many days the sale will run. If you’re downsizing from a modest apartment, a one-day event on Saturday — the busiest day of the week for garage sales — should be sufficient. On the other hand, if you have a surplus, the best option may be a multi-day sale. Bargain hunters typically begin early in the day to find the best deals. Scheduling your sale early means you’ll see a wider range of participants. Also, know your location — as a Gainesville moving company, UF Mover Guys understand local weather is finicky. Afternoon showers put a literal damper on garage sales, so scheduling an early sale may bypass a storm. When it comes to advertising, there are several dos and don’ts. Things to do include writing a compelling ad that portrays the garage sale as an event worth attending. Listing a few of your best items for sale is a great way to drive in traffic. Advertising it as a moving sale implies that you’ll have great deals or that everything must go, which typically attracts more visitors. Movers recommend posting your garage sale ad on social media, local online classified sections and in the newspaper. It’s suggested not to run the ad too many days in advance as people may forget by the time the sale date arrives. And be careful not to target your ad to areas that are too far to travel. One detail that you shouldn’t lose sight of throughout the day is the presentation of the garage sale. Before the sale begins, arrange belongings in an organized and appealing manner. As your items sell, rearrange the remaining items to maintain an impressive presentation. To keep everything organized, use moving boxes and packaging labels to sort items into categories, such as kitchen utensils, books, and clothing. Using boxes and labels also allows shoppers to find items they’re interested in easily and quickly. Note that you can purchase all of the moving boxes and materials you need for your garage sale from UF Mover Guys! Around the time you begin to plan for the move-out garage sale, you can also schedule moving services with UF Mover Guys. Whether you’re a student leaving the dorms or a family vacating a multi-story home, our team is adept to handle all sizes of moves. We have a fleet of moving trucks to transport both within Gainesville and across the country. We also offer temperature-controlled storage facilities and individual moving services, including full pack-ups as well as loading and unloading services where we do all of the heavy lifting. To schedule moving services, contact us today! For renters moving is as inevitable a part of life as waking in the morning. However, just because renters move often doesn’t mean it comes easily to them. Quite the opposite: many renters still make the same moving mistakes, some of which cause them trouble and aggravation when it’s time to move out. Here, UF Mover Guys, a team of movers Gainesville renters trust, lists common post-move errors and how renters can avoid them. The apartment isn’t yours to own; by definition, it’s a rental. However, you still can decorate however you want — up to a degree. Keep in mind: the alterations you make must be undone before you move out. Otherwise, you’re financially liable for repair costs. If you take customizations too far — painting rooms a color that’s hard to paint over; swapping out ceiling fans and appliances; attaching wall hangings with big nails that create gaping holes — that will cost you later. Instead, stick to ephemeral decorations — like sticky putty for wall art — and refrain from altering things that can’t be easily brought back to their original appearance. During all of the excitement of moving, it’s easy to let down your guard. You’re so focused on what’s in front of you, you forget about the dangers around you. But even if the area itself is safe, an Instagram post depicting your truck-full of belongings on the street side could post a security risk. Other lapses of security include leaving doors and windows unlocked, which can invite in intruders, vandals, or thieves. To deter theft at your apartment, you should remain vigilant: lock up when you’re not home, even if it’s only for a few minutes, and have a trusted confidant keep tabs on your stuff. Landlords ask tenants to clean their apartments before moving out — that’s standard practice. But this policy is a double-edged sword. It’s beneficial to you when you first move in: the apartment is freshly cleaned and in pristine condition. However, after you’ve settled into the apartment, you have to clean regularly to prevent things from quickly going downhill, at which point you’re left with a sizable clean-up on moving day. Worse still, if you don’t get things cleaned up, the landlord keeps your security deposit (usually one or two month’s rent). As a workaround, have the moving company put your belongings in storage for a few days. This gives you time to deep clean the apartment while its empty. UF Mover Guys understands the needs of renters. Our movers in Gainesville assist every tenant from students in dorms or off campus housing to families or professionals in high-end condos and townhouses. We charge no travel or fuel fees for local moves, and we have small and large trucks, climate-controlled storage, moving supplies, and anything else you’ll need to get the job done. For help moving, contact us today!